Tesla lost money this quarter. In fact, it lost about $6,909 on every car it shipped. For a start-up losing money is not only normal, but encouraged. As Amazon.com has shown us, losing money must be good, because investors love it and pour more money into the stock. However, about a year ago, Tesla sort of promised that it would not be like those types of companies. In fact, it said that the cash flow positive situation would be inclusive of capital expenditures. Woops. Tesla made money in Q1 and Q2 of this year. When it did, I pointed out to the Teslarati that it was due to Zero Emission Credits that the company had sold to other automakers so they could comply with California’s CARB rules. These are government mandates invented to spur automakers to make cars that don’t burn hydrocarbons. All of the Tesla fans told me two things; First, that I was wrong. Never mind why, just wrong. Second, that Tesla didn’t even need the ZEV credit sales to make a profit. ZEV credit sales fell for Tesla this quarter and the company lost $38 million dollars. During the quarter, Tesla shipped about 5,500 cars. Tesla has been very consistent that it planned to make about 5,000 cars each quarter (about 21,500 in 2013), and it has. So the reason Tesla lost $6,909 on every car it shipped is not because of limited production, as Elon Musk sort of tried to say is the case. In the context of its Q3 loses and future profits Bloomburg reported Elon Musk as saying “We really are production constrained, not demand constrained. We are working really hard to improve production.” However, production is right on target. The only thing missing from Tesla’s bottom line this quarter compared to the last two is ZEV credit revenue. In this quarter it reported just $10 million in sales of the credits and lost $38 million. In Q1 it made $68 million in revenue from the credits and was profitable, and in Q2 it made $51 million from them and was profitable. 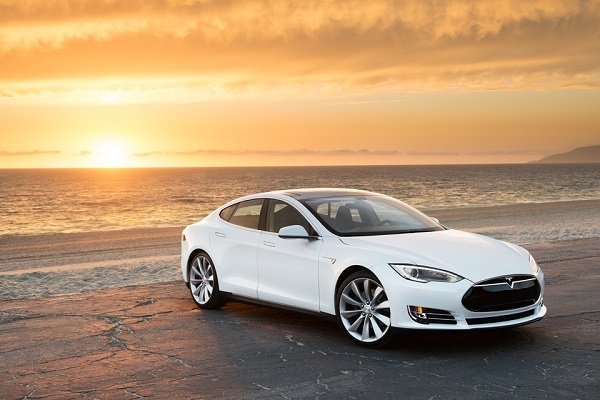 My review this summer after a test of the Tesla Model S was overwhelmingly positive. However, I still stand by my prediction made one year ago that in the long run, loses on cars like the Nissan Leaf and Chevy Volt can be absorbed by their automakers, but that unless the government simply mandates profit to Tesla, it is likely to meet the same fate that Fisker did. Nicely done, John. I don't think Tesla is going anywhere (leaving), but I think it's getting to the point where perhaps a less outspoken, more conservative CEO needs to be in charge. Musk, I think, has run his course. So, as a Teslarati, I gotta come back at you, John. Chances of being cash flow positive when rolling out stores, charging infrastructure and even assembly plants (the Netherlands) on the scale Tesla is amounts to zero. Their ploughing every penny and more into building the business, on the basis that demand exists to build on. Tesla's business plan is not geared to simply selling 20,000 cars a year - if it was, it would be job done already. Everything is geared towards ramping up to a 500,000 production cycle and a whole new selling and charging infrastructure to maintain that. Short-term investment in Tesla has been profitable for some, which has affected the share price, but the business model is not moving in the same plane! Your blind defense of the almighty Tesla missed the entire point of John's article. MUSK PROMISED NOT TO GO IN THE RED ANY MORE when the company finally showed positive cash flow. That's the whole frigging point. Spelled out for you right in the damn title. But hey, one thing most religious freaks (EVangelists) rarely do is actually read what contradicts their belief system. Aaron: chill out! While I defended Tesla, it wasn't blind and the 'point' of the article was not lost on me - the question for me is whether it's a point worth pursuing in the way John did with this article. And on that score, one has to ask. From what I understand, Musk's team planned to match spending on expansion to current turnover in order to be profitable, but remember, that statement was made before Tesla paid off it's government loan through the share issue. That certainly changed the fundamentals, and allowed for a slightly more accelerated development program. BUT, they also knew that they were eventually going to max out their CARB credits and no longer be able to sell them for profit. So, even by your justification, Musk was still completely wrong and therefore the point of the article (that ZEV credits are the reason Tesla isn't profitable and Musk lied) still stands. Which is why my original comment was: Musk may have run his course and perhaps a less off-the-cuff CEO is needed now. Gosh, Aaron, talk about shrill. Without EV credits, adjusting for leasing, the profit is 22 cents a share. That's respectable and well within targets (end of year 25 cents) set out by Musk. So, there is just the matter of cash flow, which as I've already pointed out was a claim made in a very different climate 12 months ago and which is largely irrelevant to Tesla today, having paid off their government loan. You didn't address the point one iota, did you? :) I wonder why? SIGH Please read what I said instead of searching the dictionary for words to describe how you think my tone seems to you. Point of this article: Musk said that Tesla would remain profitable after the company finally got into the black. Tesla is no longer profitable. Musk lied. The reason they aren't profitable is ZEV credits. PERIOD Everything you've said is just justification for why they aren't profitable. It's irrelevant. Mark, thank you commenting. Your passion for Tesla is noble and shared by many readers I want to reach. However, I think you are reinforcing my point. Making a "promise" to be cash flow positive inclusive of capital expenditures was not wise. With its massive market Cap. Tesla should be investing huge sums to reach some bigger goal. I have to disagree that the 2013 full year business plan was not centered around reaching a production of about 21,000 Model S cars. It is so well documented by so many green car advocates. Yes, a half million cars is part of the plan for Tesla, but it never was for this year, and the story is about cash flow now, not the company's end game. Thanks again. I hope you will like some coming stories about Tesla I am working on. Hi John. Thank you for the courteous reply. As Aaron seems to have jumped down my throat about this and you seem to have pinned the headline of the story on the fact that a year ago, Elon made references to being cash-flow positive. However, you do realise that the promise to be cash-flow positive was when the share price was still at something like 24$, and that since then, in May this year, they exploited the market cap to give a share offering which allowed them to pay off the loan and give them considerable breathing space in terms of cash flow. You didn't mention this at all? Not relevant? I think this is the single most obvious explanation of why the commitment wasn't met. And yes, in that context, it is about the end game and not 'cash flow now', as you put it. Yes, it's interesting. People are looking around for an explanation of why the better than expected results from Tesla resulted in the stock tanking. My guess is that people bought positions thinking that Tesla would outperform and go on another burst. When the results were close to expectations, a lot of investors looking to make a quick buck instead pulled - and that prompted others more insecure investors to worry about the 'bubble' that's been talked about recently. In the end, this volatility is a mixture of profit hunting and 'confidence' investment. But this only accounts for about 20% of the stock, and I really don't expect Tesla to fall below 140$, at which, it is actually a very good buy. :) Still, the issue of the fires and the engineering questions it will open up because this is new tech is something I'm interested to hear about. Some people writing about it now are in the pay of Detroit, so expect some pretty ridiculous headlines in the coming days. But otherwise, there is a serious question of about how the 'risk' of an EV battery is spread in terms of 'energy load' and how vulnerable it is to sudden energy release. As yet though, I haven't read anything convincing that would suggest that Tesla have got the balance wrong - after all, the passenger in the 100 mph crash emerged safely before the fire, as did the other occupants in the other incidents. It could be the only fires we hear about for another 12 months, which will make a lot of commentators look like chumps. Remember when a couple Chevy Volts that had been used for NHTSA crash testing caught fire in the federal junkyards...and Musk was quick to point out how Tesla battery packs were better designed to prevent fires? Whoops! It seems to me that having a car burst into flames while driving it (like the Model S) is far worse than having a Chevy Volt badly wrecked then left to sit in the weather for a few months before catching fire. As a consumer, I really dont care if I total my Volt and it catches fire at the junkyard...that is the junkyard's problem, not mine. On the other hand, having a $100k sedan catch fire and burn while driving it in traffic...that is the consumer's problem. Thank you for this. I plan to address the fire stories, but oddly, I am leaning towards defending Tesla, despite the fact that statements Elon made now seem very shortsighted. Valid assessment. As a day trader, I have bought and sold options on TSLA many times, mostly profitable The latest opportunity, though, came just before the earnings report to sell a put option for income, a bullish move. For some strange reason (likely chart reading intuition) I held back; and glad that I did. I did not think it would tank this much so fast, but, the fire situation is now compounding the market's actions toward the earnings report. From a design engineer perspective, when I was part of the first Saturn rollout in 1991, we had similar challenges in becoming profitable. Starting a new car with a new plant, new processes, new tech is not to be underestimated. In my opinion, the car is still a positive from a structural, styling and innovation standpoint. The negatives center on the high cost to the masses; and the volume required to produce profits. It will never reach great heights simply due to that cost to the masses. I still say an OEM with an HCCI or split-cycle engine air hybrid engine will more likely win the race for profitable transportation, because it can do that without an expensive battery system and an expensive body structure. Thank you Frank. We value your comments and appreciate you taking time to weigh in. Great insight - For the record, Frank is an alum of Torque News, former GM employee, and expert in automotive stocks.